Check out this cute circus dog all dressed up in a suit! This picture is just so funny. I wonder if Mommie will get me a suit like this. Teehee! You can click on the picture to see the video of the circus dogs performing. They do all sorts of neat tricks! It is lots of fun to watch. Mommie and I have watched it lots of times. I hope she is not thinking of making me learn all those tricks to earn my treats. Yikes! Speaking of treats, I got a package in the mail from Kari, Steve, Gypsy and family. Yummy oatmeal and apple treats! Thank you thank you!!! 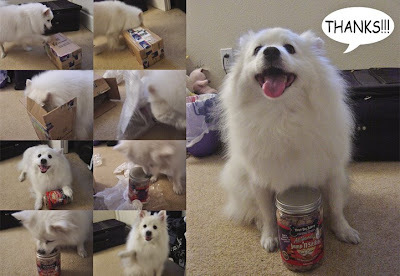 Here are some pictures of me with my new favorite snack. I love 'em! I even did a paw wave to entice Mommie to give me more. 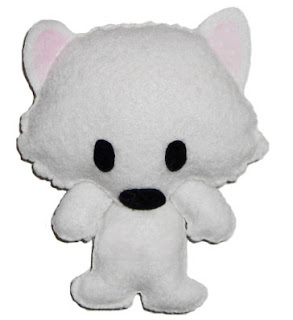 And last but not the least, I would like to let you guys know that a fundraising auction is being held for Chase the Eskie. He needs to get surgery for both his hind legs because of Medial Patellar Luxation. It is pretty painful so poor Chase needs to get this fixed. Please support Chase's auction. Mommie and I donated a few items to help out. Here is Chase. Isn't he cute? 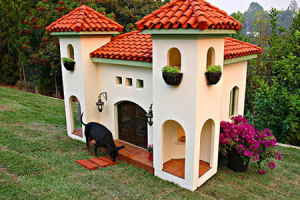 Check out these awesome doggie houses. 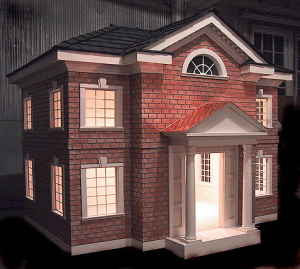 We saw these pictures on craigslist and an Eskie was modelling one of the houses. Wow! 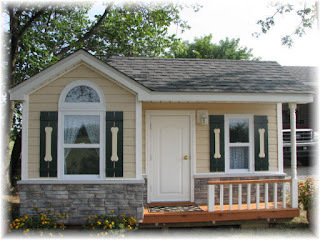 Imagine having a doggie house like this. It is so pretty. 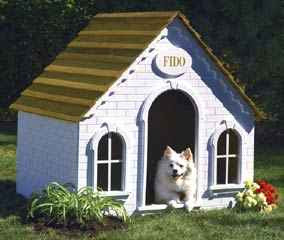 But then I would rather stay in the real house with Mommie even if these doggie digs look better. 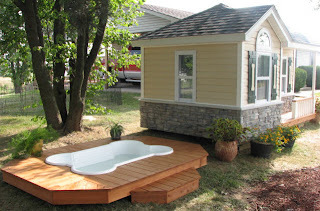 This one even has a pool! Well, maybe if Mommie wins the lottery she can get me one of these. Teehee! Stanford, Hana And Eskies Galore! I took Hana on a date today at Stanford Mall. Our Mommies were there of course to chaperone us. We had lunch at the California Pizza Kitchen. Hana and I were seated in our chairs and saw lots of doggies walking by. Hana's Mommie baked some peanut butter pumpkin cookies for us. Yummmmyyyy!!! After lunch we went around the shops and sat around checking out people walking by. There were tons of doggies there, too. And we even saw 6 Eskies! Wow!!! The first 3 we saw near where we had lunch. And the other three right before we went home. What a small world. 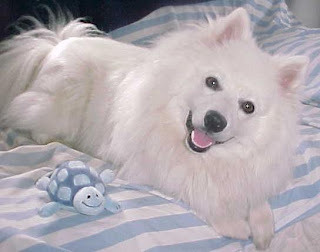 They were Eskies from the Peskipix yahoo group. Cool huh? But I was not able to say hello up close to any of the doggies. I had to be content to say hello from afar because of my health limitations but still it was quite exciting to see so many Eskies in the area. 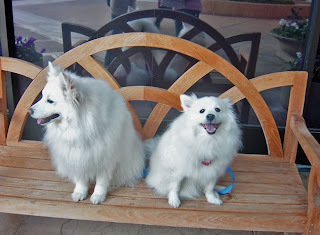 And a few people who came to pet us also said they had American Eskimo dogs at home. Here is a picture of us on a bench in front of Macy's. Hana's Mommie took more pix so be sure to check out her blog. Another gift I got for Christmas was this new bed my cousin Brenny got for me. It is so soft and comfy! I love it! Mommie could not resist taking my picture. She put all the Christmas cards I got this year all around me. It got really crowded on the bed but I was too sleepy to resist.